A collection of short stories, The Bloody Chamber and Other Stories was first published in 1979 and awarded the Cheltenham Festival Literary Prize. 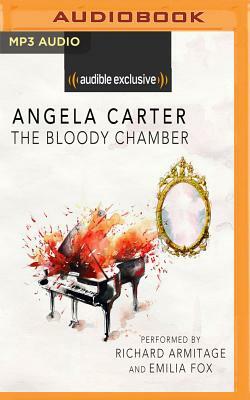 This Audible exclusive adaptation is narrated by legendary actors, Richard Armitage and Emilia Fox, who take on different chapters of the audiobook. Among these are 'The Bloody Chamber', 'The Courtship of Mr Lyon', 'The Tiger's Bride', 'Puss in Boots', 'The Erl-King', 'The Snow Child', 'The Lady of the House of Love', 'The Werewolf', 'The Company of Wolves' and 'Wolf-Alice'. The Bloody Chamber and Other Stories is a titillating series of dark, sensual and fantastical stories, inspired by well-known fairy tales and folklore. Dissatisfied with the unrealistic portrayal of women in these legendary fables, Carter turns them on their head, introducing subversively dark, sensual and gothic narratives. Breathing new and unexpected life into favourite childhood characters such as Red Riding Hood, Bluebeard and Beauty and the Beast, Carter shocks, seduces and amuses the listener with her unique, iconic and surrealist reimagining. She studied English at Bristol University before travelling, teaching and writing numerous best-selling novels. They have all received critical acclaim and remain firm favourites of modern English literature. Angela was a feminist throughout her life, wrote for Spare Rib magazine and voted Labour. Her novels are wholly reflective of her world views and continue to inspire new generations of men and women worldwide. Best known for his roles in The Hobbit, Hannibal, Captain America, Robin Hood, Spooks and North and South, Richard Armitage has established himself as one of the greatest British actors of our time. With 14 audiobooks under his belt, including David Hewson's Romeo and Juliet: A Novel and Georgette Heyer's Venetia, Richard's story telling abilities have not gone unnoticed. In 2014, he was merited with having narrated the Audiobook of the Year, Hamlet, Prince of Denmark: A Novel. Emilia Fox is an English actress who has starred as Dr Nikki Alexander on BBC Crime drama, Silent Witness, since 2004. Her other TV and film credits include Merlin, Pride and Prejudice, The Pianist, The Casual Vacancy and Inside No. 9. Also no stranger to audiobook productions, Emilia delivers a myriad of powerhouse performances such as in Philippa Gregory's The White Queen, Muriel Spark's The Complete Short Stories, JP Delaney's The Girl Before and Anne Bronte's Agnes Grey.